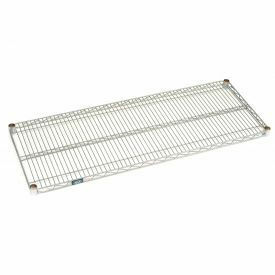 Global's NSF Certified, exclusive Nexel® (Medium Duty) Wire Shelving Units are ideal for lighter products when a lower capacity shelf is requied. Available in Zinc-Chromate, Black Epoxy & Green Epoxy finishes. 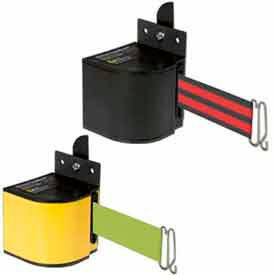 All units ship in one convenience carton with heavy duty, two piece posts. 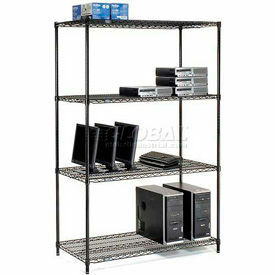 Open wire shelving permits air and light penetration and minimizes dust accumulation. Nexel®s patented truss reinforced shelves provide extra strength that outlasts the competition. Easy slide-off shelf surfaces speed stocking and picking. 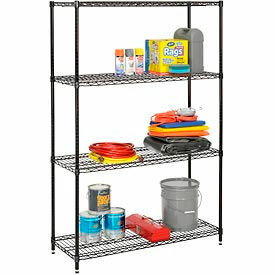 Wire shelves adjust without tools and align at 1" increments. Meets NSF standards. Easy assembly. Each Unit includes four (2 pc) posts with leveling feet, four (400 lb cap) shelves and snap-on sleeves to secure shelves to posts.